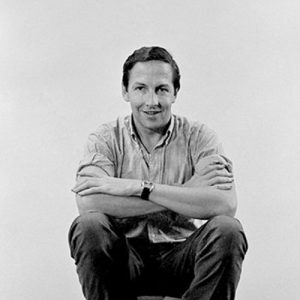 Robert Rauschenberg’s pioneering practice encompassed assemblage, painting, sculpture, photography, printmaking, performance, cutting-edge technology and conceptualist methods. He emerged as one of the leading artists of his generation in the 1950s, when he broke the stranglehold of Abstract Expressionism and introduced artistic innovations that anticipated later movements such as Pop, Conceptualism, and Minimalism. Rauschenberg was born in Port Arthur, Texas, in 1925. His first meaningful encounter with art occurred while serving with the US Navy in California and soon after demobbing he enrolled at the Kansas City Art Institute on the GI Bill. Rauschenberg also studied at the Académie Julian in Paris and the Art Students League of New York, but his most formative education occurred during intermittent stints at the progressive Black Mountain College in North Carolina. It was here, under the often-disapproving eye of his tutor Josef Albers, that Rauschenberg first began integrating found objects into his work and was encouraged to explore chance processes by the avant-garde composer John Cage and dancer Merce Cunningham. Rauschenberg initially challenged the Abstract Expressionist zeitgeist with his monochromatic ‘White Painting’ series of 1951 and appeared to perform an act of symbolic patricide with his conceptual artwork Erased de Kooning Drawing of 1953. During his travels through Italy and North Africa with Cy Twombly in 1952–53, Rauschenberg created a series of collages and small assemblage sculptures that reveal the influence of Marcel Duchamp, Joseph Cornell and Kurt Schwitters on his work. The multimedia black paintings and red paintings completed on his return to New York led to his most celebrated works – the so-called ‘combines’ that embodied his stated desire to act in the gap between art and life. With works such as 1955’s Bed, Rauschenberg integrated waste materials and painterly affect, dissolving established artistic boundaries and re-establishing representation in an art world dominated by abstraction. Alongside the flag paintings of his close friend and colleague Jasper Johns, Rauschenberg’s combines were pivotal to the emergence of Pop Art in America. He continued to be aligned with the movement through his development of image transfer techniques and screen-printed paintings based on mass media imagery. In 1964 Rauschenberg was awarded the grand prize for painting at the Venice Biennale. During the following decades his work continued to encompass a wide variety of fields. These included elaborate installations, performances, set and costume designs, and epically scaled artworks such as the 16.5-meter-long silkscreen print of 1970, called Currents. As his fortunes grew, Rauschenberg also embarked on a number of philanthropic ventures, including the establishment of the ROCI (Rauschenberg Overseas Culture Interchange) that sought to foster cross-cultural collaborations with the aim of promoting world peace. Rauschenberg’s roving experimentalism and prolific output has left a daunting legacy, while his generosity and activism did much to support those artists who follow.